The LevelUp Team is excited to announce that we're now taking registrations for the next LevelUp program in Brisbane! Register now! You can go to the registration page to register your application. Get in fast - registrations close on the 13th of March but places fill up quickly. You can go to the registration page to register your application. Get in fast - registrations close on the 19th of October but places fill up quickly. Luke Mico is the winner! Read on for Lukes's blog post that effectively captures what the kick-off day is all about. Hey, my name is Luke and I'm pretty fresh to the world of web development. Experience-wise, I'm a code newbie having completed the General Assembly Immersive program. After a career in marketing communications, I'd been itching for a challenge when out of the blue, my eyes opened up to coding and the Wonderful World of Web development (see what I did there!). After hearing about the LevelUp program, I was curious to know more, so I submitted my application. With the stars aligned, I was accepted to join LevelUp Build 11 - Sydney. BOOM! With some trepidation, I arrived at ThoughtWorks Sydney offices for the official kick-off day session, unsure of what lay ahead, but excited about the potential. Any fears were cast aside, as I was introduced to a super-friendly, excited group of participants across web developers, UX designers, product managers and a welcoming team of ThoughtWorkers to boot. With introductions made and a quick team building challenge involving tennis balls, it was straight down to business with a presentation on the LevelUp program, what to expect, as well as a glimpse into the projects we would be developing. Hearing about the team projects, technologies we will use including Node & Git, working using Agile methodology, continuous integration, and testing was incredibly exciting. With our designated teams in place, we spent some time fleshing out user stories and getting to know my team. Sandwiched in-between, we found time to take part in a team #selfie challenge on the streets of Sydney CBD. No tourists were injured in the process, luckily! To wrap the day, each team presented outlines of the project, their Story Cards, User Stories findings which underpin plans for the coming weeks. With Day 1 completed, I left feeling brimming with ideas and enthusiasm, keen to get stuck into the program and see what we can produce! In the lead up to LevelUp EXP, the Sydney LevelUp team ran a Guest Blog competition. On Saturday 30th January I had the opportunity to attend LevelUp EXP hosted by ThoughtWorks. The event ran from 11:00am - 4:00pm with lunch and drinks provided. The day was jam packed full of interesting events running simultaneously spread throughout the ThoughtWorks office space, each session lasted between 20-40 minutes. We started the day with a quick introduction followed by our opening keynote speaker. Flick gave a really interesting speech detailing steps we as a community should be taking towards cyber security and explained what a Cryptoparty is and just how beneficial they are for the public. She spoke of the importance of security online and how technology can have a high impact on social justice. And also how we can promote the importance of security to family and friends. It was clear this was an area she is extremely passionate about. Then the fun began as we all scrambled to attend the events that we were most interested in. The first event I chose to attend was an introduction to developing in Android. We were shown the basics of how to set up an Android application and a short demo on building a simple list application. My next event was developer war stories, where two ThoughtWorks employees shared some of their most frustrating experiences as developers. My third event for the morning was all about test driven development and the red green refactor cycle. Two ThoughtWorks employees took us through not only the steps of TDD but also shared personal experiences as to why TDD is so important to utilise while developing. They also demonstrated building a shopping cart application using TDD methods. We had a 45 minute break for lunch which gave us time to roam and speak with other students and ThoughtWorks employees, and then the afternoon sessions began. The first event I chose was the careers question and answer session. 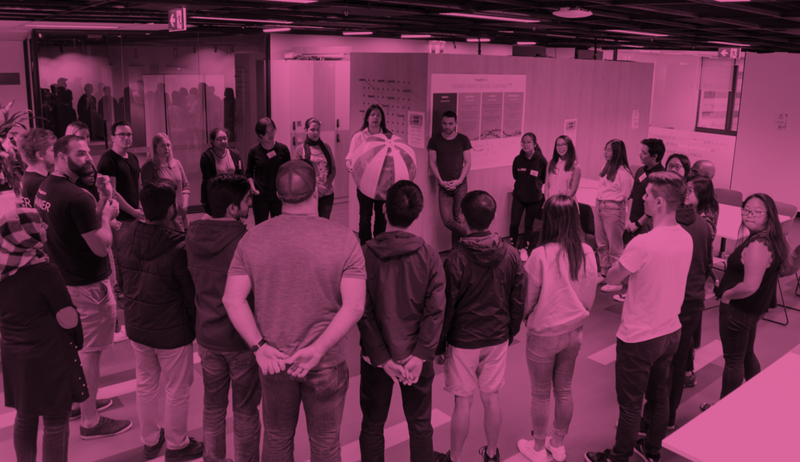 Two ThoughtWorks employees went over resume tips, interview tips, and previous experiences they have had as being recruiters. They gave us insight into what recruiters in the industry are looking for and appropriate ways that we can stand out from the crowd. The next event was HTML and CSS animation. In this session we were shown some tips and tricks for animation and timing techniques in CSS. The last event I attended for the day was the coin game. The coin game was a team exercise which showed just how important effective communication and planning can be in any team environment. Our closing keynote address was an extremely heartfelt and emotional speech by Gerry. He spoke of his experiences working at ThoughtWorks and the incredibly important work he has been able to do with Unicef. It really was an amazing way to end the day. After our closing address we had drinks and ice cream to finish off the day. ThoughtWorks employees stuck around and spoke with the students for several hours answering our questions and entertaining us with some pretty incredible stories. Thank you ThoughtWorks for sharing your knowledge with the community and helping students find their feet in the industry.